Can I Sue a Driver in an Accident If They Didn’t Hit My Car? Accidents do not have to involve two vehicles colliding physically with one another for a driver in another car to still be liable for your accident. This may sound complex, but this area of the law is known as no-contact accidents – and they are quite common. In a no-contact accident, the driver of the other vehicle forces your vehicle off the road or into another object, causing a crash. The other driver’s negligence is what forced you into an accident – even if they did not physically strike your car. No-contact accidents are extremely complex, especially because you must prove fault when one driver never actually hits your vehicle. Also, if the other driver is unaware they even caused a wreck; they may leave the scene of the accident. Without their identification or license plate, it may be difficult to find them and hold them responsible for their actions. The first step is to locate the other driver. If you have a description of the car or even a partial license plate number, that can help law enforcement find them. If you have no identification or license plate information, you may find it difficult to sue them for compensation. In this situation the insurance industry does have remedies so that you can still collect without identifying the no-contact driver. The vehicle that left the scene should fall under the uninsured motorist coverage of your auto insurance policy. You are required by law to carry uninsured motorist coverage – for this very reason. The coverage in your policy can vary and your insurance may have specific requirements for using this type of coverage. 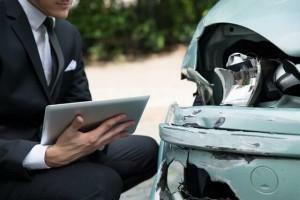 In some instances, insurance companies will require that you have a corroborating witness to the no-contact accident. This is because without a witness, how will insurance know that the accident was truly caused by someone else and not yourself? A corroborating witness can be anyone present at the scene that saw the accident. This can include another person in the accident, your passengers, a person passing by or another motorist that observed the incident. Some insurance policies are more lenient and do not require a corroborating witness. It is imperative you see what your policy requires and be careful about which witness you have. Some insurance policies will have language that prohibits witnesses that are not an independent third party – meaning someone that has no stake in your insurance claim. Reading through the policies and exclusions in your own insurance policy can be daunting – especially when you are attempting to recover from injuries. If you were involved in a no-contact auto accident, do not assume you have no options for recovery. Instead, contact the attorneys at Van San Law. today. We can assist you with your no-contact claim against your own insurance or the responsible party. Schedule a consultation now at 404-991-5950 or fill out an online contact form to learn more.